Charlie leads an occasionally hassled but seemingly happy life. She has a fulfilling job as a teacher, cohabitates with (and is planning to have a baby with) her boyfriend Marco (Aleksandar Radenković), and has a supportive, fun-loving grandmother, Lisbeth (Angelika Waller). But Charlie is not entirely comfortable with the direction her life is moving in, to the point where she secretly takes birth control pills. While her life is supposedly going the “right” way, she also seems to crave a degree of youthful abandon. Why can’t she be happy with her lot in life? Away You Go really doesn’t exactly have anything new to bring to the table, but this is not a major hurdle to enjoying the film. The whole affair is amiable with sparkling dialogue and delightfully likeable performances, that it’s easy to forgive and forget the been there, done that nature of the narrative. Though much of the movie centres around its protagonist’s self-analysis of sorts, at no point does she seem in the slightest bit self-obsessed. The scope is small and personal, and it can sometimes feel as though the story could be slightly rejigged into a cute TV pilot. Still, even though it’s not the most cinematic (or original) of pieces, Away You Go is a film with a personality… and a good-natured one at that. 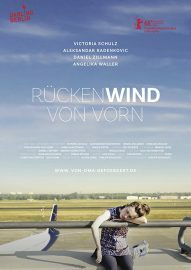 Rückenwind von vorn (Away You Go) does not have a UK release date yet.